The bad trans fats are, again not surprisingly, created by man and added to processed foods. Trans fats are actually a byproduct of the process of hydrogenation which is used by the food industry to make polyunsaturated oils more shelf stable by adding extra hydrogen atoms to them. This process makes the oils partially saturated and therefore usually solid at room temperature. The “saturation” of a fat refers to how much room there is for more hydrogens in the fatty acid chain. Polyunsaturated fats have room for more than one hydrogen to be added, mono-unsaturated fats only have room for one additional hydrogen, and saturated fats have no room for more hydrogen. Margarine and Crisco are examples of oils that have been hydrogenated. When oils are hydrogenated some of the molecules unintentionally become trans fats. 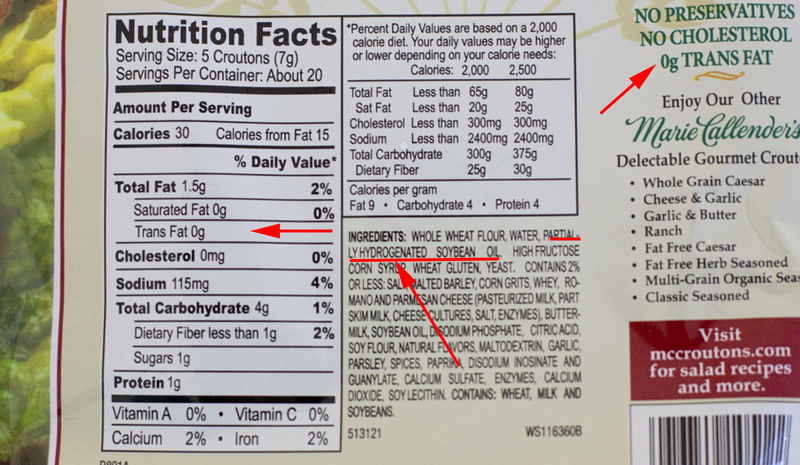 On this nutrition label for croutons note they boast of zero trans fats and yet the second ingredient is partially hydrogenated soybean oil. Also, notice how many croutons make a serving according to them! Foods that often contain partially hydrogenated fats include most bakery type items (breads, muffins, cakes, crackers), whipped topping, microwave popcorn, margarine, shortening, frozen french fries (and fast food french fries), many prepared meats (check fish sticks and fried chicken), and peanut butter (except natural type). Breakfast cereals, potato chips, and even ice cream may also contain these oils. This is only a partial list! Search these fats out and ban them from your house. So how do you know if a food contains trans fats? Read the ingredients listed on the label of every food that has been processed in any way. Look for the words hydrogenated or partially hydrogenated (fully hydrogenated seems to be ok as far as trans fats goes) . If it contains partially hydrogenated oils then it contains trans fats ( if it only says “hydrogenated” it may or may not contain trans fats). Don’t buy it; find a similar product that was not manufactured using these fats or make your own from scratch using real butter or coconut oil (not the hydrogenated kind) or olive oil. You may not be able to make this move all at once, but cut out as many as you can now and resolve to get to the point of zero tolerance for partially hydrogenated fats. Like me on Facebook for updates and to join in the discussion on health!